Lisa and Leo’s Organic in Silimakuta, Sumatra. My love affair with Indonesian coffee began early, while I was new to the coffee industry, and still coming down from the seething iconoclastic urges of my teenage years. My fellow baristas loved Ethiopian, Colombian, and Brazilian coffees, but something pushed me towards the bracing earthy and herbal notes that took the foreground in coffees from the Indonesian archipelago. That same something later pushed me towards things like Laphroaig whisky, chili-addled delicacies, and Kretek clove cigarette lung torpedoes. But those are stories for another time. Like anyone, I began to appreciate the more nuanced flavors of coffee only after tasting coffee day after day. Victrola’s Bolivia Juan De Dios Blanco and later 49th Parallel’s Ethiopia Beloya Micro-Lot #3 opened my eyes to the breadth of flavors that can be present in coffee, and I always looked forward to tasting a new coffee with my coworkers and friends. Thomas Surprenant and Samuel Lewontin were my consistent tasting companions, and together we spent a fair amount of time staring blankly out of windows in awe of the sweet emulsions that had just graced our papillae. They were good days, but it was rare indeed that all three of us agreed that an Indonesian coffee was blowing our mind. Some Indonesian coffees continued to pull at my tongue-strings, however. In particular, Lake Tawar, Blue Batak, and Toarco Jaya coffees were consistently good from year to year. To a younger me, these coffees vindicated my positive view of Indonesian coffee in general. Later, I realized that I would need to take a more critical stance to understand what it was about these coffees that drew me in, and to provide me with material for starting a true dialogue with my peers. All this eventually led me to Indonesia to seek out answers for myself. The Indonesian island of Java has long been synonymous with coffee. But it's only in the past decade or so that Indonesians have begun to wake up and smell the coffee — their own, that is. Big changes are brewing in the country's coffee industry, as demand from a rising middle class fuels entrepreneurship and connoisseurship. The trend is clear at places like the Anomali Coffee shop in South Jakarta. It roasts its coffee just inside the entrance on the ground floor. If you walk into the roasting room at just the right moment, as the heat caramelizes the sugars in the coffee beans, it smells like someone is baking cookies. Get close to the roasting machine, and you can hear the beans snap and pop. "It is the bean expanding because of the heat of the core," explains Anomali's founder Irvan Helmi. Anomali Coffee includes a trading company that wholesales to hotels and other businesses. It also has a barista training academy. And upstairs from the roasting ovens is one of its seven cafes. On a table, bags of beans from a half-dozen single origins are on sale. A blackboard ranks the beans in terms of their acidity and body. "In Toraja, you also have a medium body, chocolaty and caramel, herbs," Irvan says, picking up a bag of beans from Sulawesi Island. Indonesia's more than 17,000 islands teem with cultural diversity, and more plant and animal species than researchers can catalog. Little wonder, then, that from Aceh in the west to Papua in the east, the archipelago has more coffees than Irvan's tasters can get around to tasting. J.M. Smucker’s (SJM) move this week to boost the price of its Folger’s and Dunkin’ Donuts brand coffees is a financial jolt for java junkies. After all, U.S. consumers have enjoyed falling prices in recent years. According to the Bureau of Labor Statistics, the average price for a pound of coffee as of November was $4.31, down from $5.04 in 2013. That was then. Now, the price of coffee futures is around $1.49 per pound, up more than 15 percent from a year ago. And bean costs are rising. FocusEconomics expects prices to average $1.65 by year-end, with the price increase driven by lackluster supply and growing consumption in the U.S., China and India. Indeed, commodities broker Shawn Hackett thinks coffee futures could hit as much as $3 a pound at some point during 2017. “They certainly are going to go up a lot, possibly even more than last year,” he said, adding that the “danger zone” for the coffee market is between now and the spring harvest. According to the International Coffee Organization, economists have found that when the price of coffee futures go up, consumers usually see a price increase; but when futures prices fall, retail prices don’t typically fall at the same rate. One key factor pushing up prices: weather. Several years ago, coffee production fell when the weather pattern known as El Nino, tied to above-average temperatures in the Pacific Ocean, lead to a multi-year drought in Brazil and Vietnam, the world’s top two producers. During the most recent growing season, meanwhile, Vietnamese coffee growers were pummeled during harvest seasons by floods. Many people like to start their days with a cup of coffee. And some of those people can be extremely particular about how they take their coffee. One of the people is Howard Schultz, the outgoing CEO of Starbucks (SBUX). The billionaire coffee magnate’s go-to is a cup of Sumatra, brewed his favorite way — in a French press. He described his first time drinking a cup of Sumatra while visiting the original Starbucks store in the Pike Place Market district in 1981. At the time, he was a general manager for Swedish drip coffee maker, Hammarplast. Starbucks, then a single-store roaster and retailer of whole bean and ground coffee, was a client. 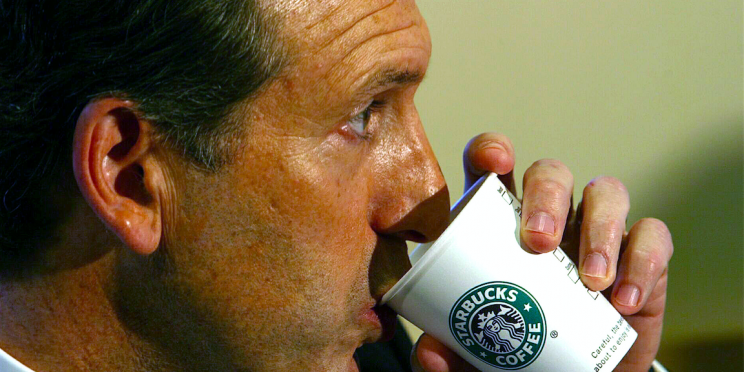 Three sips in, Schultz was hooked. After visiting the original store that day, Schultz went to the Starbucks roasting plant to meet the owners of the company, Jerry Baldwin and Gordon Bowker. Baldwin brewed him a cup of coffee in a French press for the first time, showing him the way coffee should be brewed. Schultz would eventually buy Starbucks and expand it into the coffeehouse empire it is today, with more than 24,000 locations worldwide. Last week, Schultz announced his resignation as CEO, effective April 2017. He’ll assume the role of executive chairman, while Kevin Johnson, the company’s president and COO, will take over as CEO.